After a long drive back from Sydney I wanted a beer with a bit of body and bite to it. 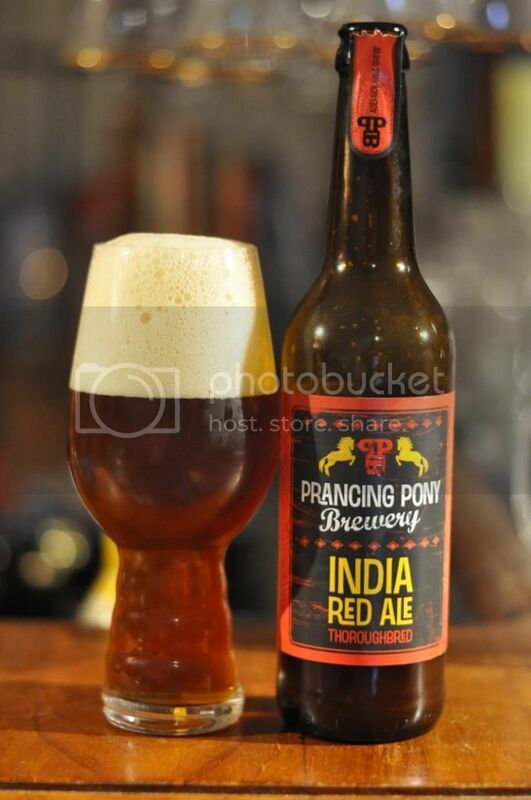 That led me to this; the Prancing Pony (the brewery I visited outside of Adelaide earlier this year) India Red Ale. It was the pick of the bunch for me at the brewery and I'm hoping it will be just as good now. 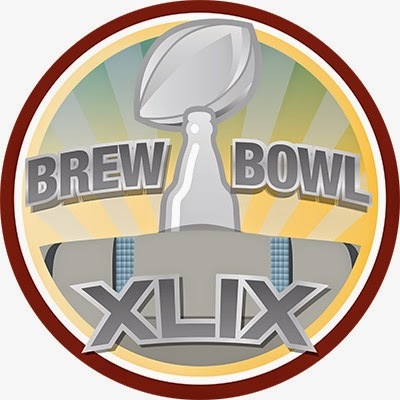 Brew Bowl is a yearly recurring badge to commemorate the Super Bowl, the premier day on the American sporting calendar. This year is Brew Bowl XLIX, or 49 for those who can't deal with Roman numerals, which funnily enough is the same number as this years Super Bowl. I look forward to the game every year and this feels like it should be a great warm up beer. The body of this beer pours an amber colour with an orange tinge. It's quite an odd colour but is also quite alluring with it's big 4 finger white head of white head. The retention is not amazing but there is still a thin layer of foam over the body of the beer throughout drinking, to go along with some reasonable lacing as well. For the style it's a really nice looking beer. Onto the nose and I get plenty of fruitiness at first. I'm getting apricot, peach and some other fruits that I can't name off the top of my head. There's also a spiciness as well, which I think might be cinnamon... The caramel malts are quite prominent on the nose. It seems balanced, let's see if it carries over to the taste. Prancing Pony's India Red Ale is wonderfully balanced! The caramel malts combine brilliantly with the fruitiness from the hops. I still get the apricot and peach as well as some passionfruit and some hints of citrus. The spiciness is also quite noticeable and really adds something. This really is a spectacular beer! Prancing Pony are Australia's only Fire Brewer's, read their website here for more details. They say this brings out a bit more caramelisation - and I have a feeling that the spiciness may come from this process as well. Despite this special relationship they have with malt, this India Red Ale still has plenty of hops. It's a brilliantly balanced beer; hell it's a brilliant beer full stop! The 7.9% ABV doesn't seem out of place either, although you can feel it by the end of the 500ml bottle. If you see this beauty buy it, it's a great beer!